A children's Advil product is being recalled after consumers complained that the dosage instructions on the label are written in different units than what is on the dosage cup. 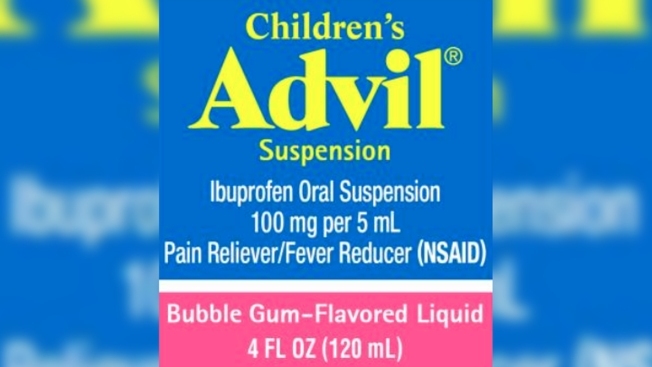 Pfizer Consumer Healthcare on Monday issued the recall for four-ounce bottles of bubble gum-flavored Children's Advil Suspension, which give instructions in milliliters but has a dosage cup marked in teaspoons, according to a voluntary recall notice posted on the company's website. "Pfizer concluded that the use of the product with an unmatched dosage cup marked in teaspoons rather than milliliters has a chance of being associated with potential overdose," the notice says. Pfizer didn't say whether anyone had been sickened due to the discrepancy. Ibuprofen overdose can lead to nausea, headache, vomiting, blurred vision, dizziness and drowsiness, according to the pharmaceutical company. NBC has reached out to Pfizer to learn if anyone has reported being sickened. Anyone with with questions about the recall or who want to report someone being sickened can call 1-800-88-Advil (1-800-882-3845) between 9 a.m. and 5 p.m. on weekdays. The recalled product was sold nationwide between May and June of 2018. It has a lot number of R51129 and an expiration date of 11/20.